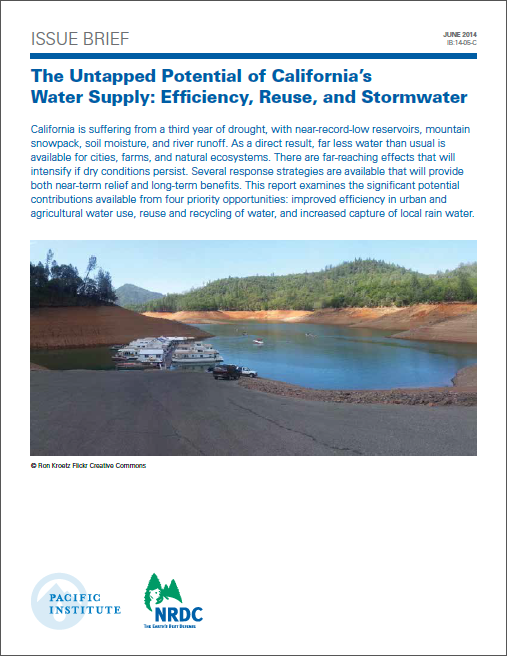 – Agriculture uses about 80 percent of California’s developed water supply. Agricultural water users can develop more sustainable water use by expanding adoption of key modern irrigation technologies and practices, such as drip irrigation and precise irrigation scheduling. Some farmers are already employing these practices, which, extended, can reduce agricultural water use by 17 to 22 percent – or 5.6 to 6.6 million acre-feet of water annually. These savings are the equivalent to the surface water that Central Valley farms are lacking this year due to the drought. –Urban areas use about 20 percent of the state’s developed water supply, much of which is delivered from reservoirs hundreds of miles away at great ecological and energy cost. Improved efficiency, stormwater capture, and greater water reuse can together save a total of 5.2 to 7.1 million acre-feet of water per year, enough water to supply all of urban Southern California and have water remaining to help restore ecosystems and recharge aquifers. These approaches also cut energy use, boost local water reliability, and improve water quality in coastal regions. 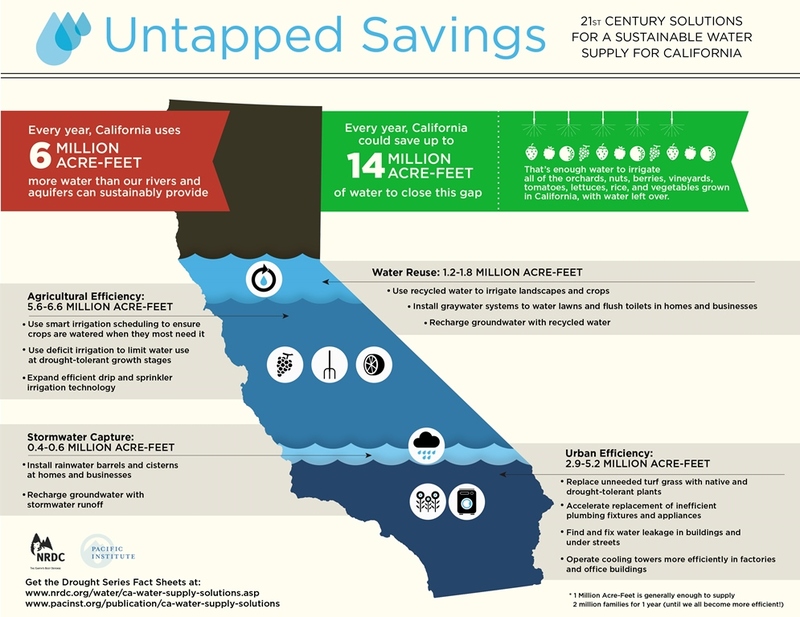 –In total, these 21st century water supply solutions can offer up to 14 million acre-feet in new supplies and demand reductions per year, more water than is used in all of California’s cities in a year. 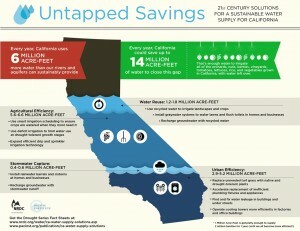 These savings would provide enough water to serve 20 cities the size of Los Angeles, every year. Sustainably managing California’s water, planning for climate change, ensuring communities have a voice in decision-making, eliminating environmental inequities, supporting a thriving economy and environment: these are the critical challenges of our time. And these are the issues the Pacific Institute researches, influences, and responds to, impacting what happens today – with a vision for the future.